Aberdeen University New Library officially opened to the public in a ceremony attended by Her Majesty Queen Elizabeth II of Great Britain at the end of September. Designed by Schmidt Hammer Lassen, the shimmering new library replaces the 1965 Queen Mother Library and holds an amazing collection dating back to the 13th century. 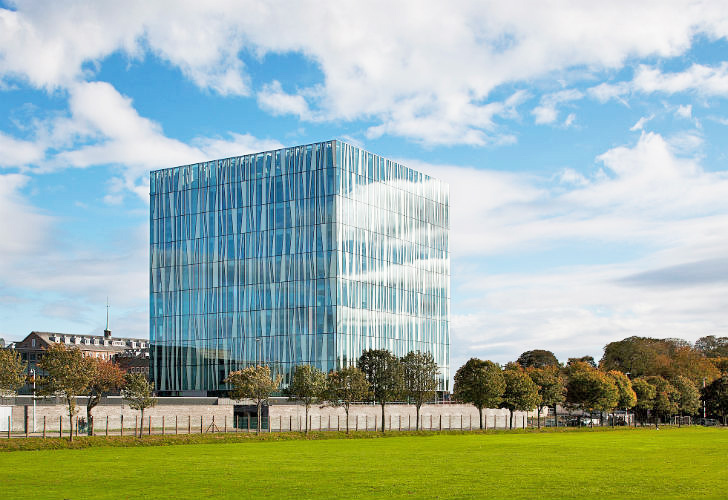 Prominently situated on the west end of the University of Aberdeen campus, the cubic library has achieved a BREEAM Excellent rating with the help of an energy efficient design, rooftop photovoltaics and rainwater harvesting. The Aberdeen University New Library, now know as the Sir Duncan Rice Library, houses over a quarter of a million books and manuscripts inside it’s shimmering cubic volume. Located on the west side of campus, the library creates an important connection with the city and will serve a community of 14,000 students. Schmidt Hammer Lassen one 1st place in a competition in 2005 to design the building, which was recently opened to students in September. The 9-story cubic volume has a strikingly organic interior with a large spiralling atrium that connects the floors together and funnels light inside from a skylight on the roof. Positioned on a base of Scottish stone, the welcoming space encourages students to study and welcomes the public for exhibitions, readings, and other events. Schmidt Hammer Lassen designed the library to minimize energy use as a way of reducing overall operating costs. The building has achieved a BREEAM Excellent rating due to a variety of sustainability strategies. The building’s envelope is made up of high performance glazing and insulated panels that allow for daylighting, but work to reduce heat gain and glare. Energy efficient lighting and a displacement air system further reduce energy use. Rainwater is harvested from the roof and is recycled in the lavatories. Finally photovoltaic panels are located on the roof to supplement the building’s electricity requirements. Invisible cube outside, Guggenheim on the inside. me no likey. it would be much better if exterior were organic too. 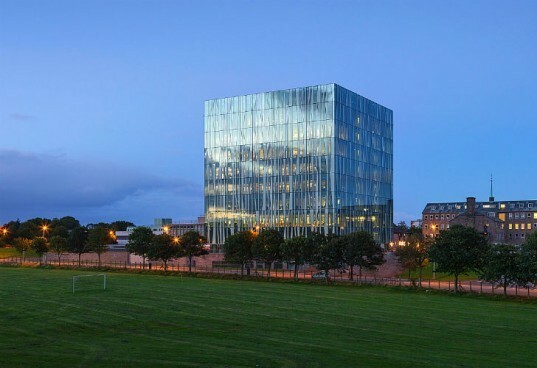 The Aberdeen University New Library, now know as the Sir Duncan Rice Library, houses over a quarter of a million books and manuscripts inside it's shimmering cubic volume. Located on the west side of campus, the library creates an important connection with the city and will serve a community of 14,000 students. Schmidt Hammer Lassen one 1st place in a competition in 2005 to design the building, which was recently opened to students in September. Positioned on a base of Scottish stone, the welcoming space encourages students to study and welcomes the public for exhibitions, readings, and other events. The 9-story cubic volume has a strikingly organic interior with a large spiralling atrium that connects the floors together and funnels light inside from a skylight on the roof. Schmidt Hammer Lassen designed the library to minimize energy use as a way of reducing overall operating costs. The building has achieved a BREEAM Excellent rating due to a variety of sustainability strategies. The building's envelope is made up of high performance glazing and insulated panels that allow for daylighting, but work to reduce heat gain and glare. Energy efficient lighting and a displacement air system further reduce energy use. Rainwater is harvested from the roof and is recycled in the lavatories. Finally photovoltaic panels are located on the roof to supplement the building’s electricity requirements. Floor plans and cross sections.